You are here: Home / Appeals / Fund a Need / Raise the Paddle / Can you cancel the silent auction for a Fund a Need auction instead? I was speaking in Topeka, KS, about two weeks ago. I mentioned that some participants might want to eliminate their silent auctions and instead offer a well-orchestrated Fund a Need auction. I wasn’t kidding. Well-orchestrated Fund a Needs surpass the silent auction revenue at a number of my clients’ galas. Some of my clients who run silent auctions are keen to eliminate them. She’s not my only client with this “kill it” attitude. Another client eliminated her silent auction years ago. Her 300 guests enjoy a raffle during the reception period. No silent auction. No games. Nothin’ but a raffle. It will depend on the gala as to whether eliminating the silent auction makes sense. With the first client, the silent auction has been kept. With the other client, she’s never offered one and has no plans to. Here’s one thing I know … if you’re going to run a Fund A Need auction, don’t assume that because you’ve seen it a couple times, you understand the mechanics of it. To do so would be like saying that you — as a guest at a wedding — understand what the bride is thinking. Honey, you have no idea what the bride is thinking. The bride knows everything happening behind the scenes. As a guest, you lack that information. The bride noticed that the caterer swapped out the portobellos in the appetizers for cheaper white cap mushrooms. The bride knows Aunt Ellen is unhappy with the seating chart and has demanded to sit at a different table, away from cousin Margo. The bride got a phone call telling her the band is stuck in traffic. The bride knows that she’s suffering through a blister on her right heel. But as a guest at her wedding, you’re unaware. There you sit … starry-eyed … enjoying the celebration … thinking the bride looks lovely … and swallowing those appetizers without realizing the mushrooms are all wrong. To be blunt, you don’t know what the HELL is GOING ON. You’re oblivious because you weren’t working behind the scenes. When it comes to planning a Fund a Need, that’s how most people are. Oblivious. Most auction guests don’t have any idea how to run an auction or its many components, like a Fund a Need. That’s because ATTENDING an auction is different than PLANNING an auction. Riiiiight. Of course you do, Sugar. 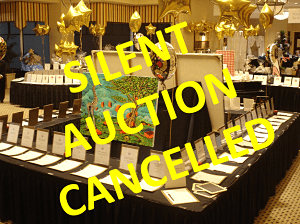 So before you abruptly cancel your silent auction and replace it with a Fund a Need, learn how to do it properly. Here’s my DVD webinar, where you can get procedures, forms, scripts, and behind-the-scenes information to make you an auction insider.